After disappearing from the wild and being carefully reintroduced and conserved, only about 40 endangered red wolves live in the wild in the entire world. They now make their homes in the forests and marshes of eastern North Carolina where an amazing “foster family” program for helping the species recover is in jeopardy of being discontinued. In the Spring, wildlife experts would go out in search of breeding pairs and keep close tabs on them, watching for the exact day when the litter is born, usually sometime in April or May. After the mother has her pups, it’s time to search for the den site—which is tricky and can take some real skill as she will have multiple dens to help keep the pups hidden. If she’s spooked or senses the pups have been discovered, she moves them out of the den and the search starts all over again. Now if the wildlife experts could get close enough to the den in the wild, they count the pups. If the litter is small, two or three pups, and their eyes are not yet open– the litter is a great candidate for foster pups. The only way this will work is if there is a donor captive litter that is close in age by a few days and also sufficient in size so that removing one or two pups for placement in the wild will not decrease the litter too much. 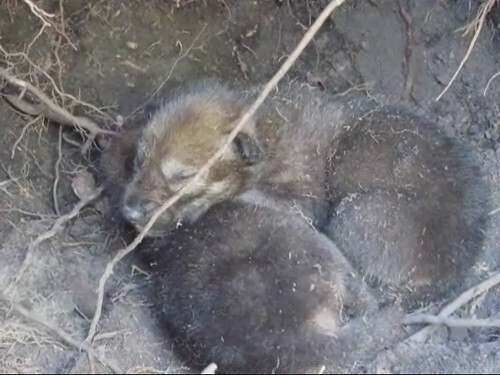 Then one or two of the captive born pups were carefully moved to the new foster den in the wild, but it must be done quickly as they should not be without a mother for more than 24 hours. The wild pups are stimulated to urinate on new pups so they will have the scent of the wild litter. When the mother comes back, she accepts them and raises them as if they are her own. Part of this success may be due to the strong family ties red wolf breeding pairs have in the wild. They typically stay together for life and have new litters together every year. And often older sibling offspring from the previous year will stick around with the family and help feed and raise the new pups. Red wolves in the wild are cooperative breeders – sibling offspring from the previous year will stick around and help raise new pups. Photo USFWS. One of the wildlife experts leading the fostering program said, ” The stars have to align just right for this to work.” And thankfully, the Red Wolf Recovery Program had been working wonderfully. But the U.S. Fish and Wildlife Service may now significantly cut efforts to save red wolves in the wild. The U.S. Fish and Wildlife Service is proposing to dramatically scale back recovery efforts and allow red wolves in the wild to be captured, harassed or killed if they roam onto private property. This represents a significant shift in the Service’s resource allocations. Because of this shift, the 40 red wolves remaining in the wild face a very uncertain future.